When it comes to nursery safety, you’ve done your homework. Crib bumpers? BAD. Got it! But without all that beautiful bedding, baby’s new crib may be looking, well, a little naked. So what’s a design-savvy, safety-conscious mama to do? Want to learn more about this pretty (and practical) bedding trend? Here’s what you need to know. Are Crib Rail Covers Safe? Unlike bumpers, which restrict airflow and pose a risk of entrapment, rail covers remain well above your infant’s reach, leaving the baby’s sleeping environment clear and free of soft, pillow-like surfaces. By the time your little one can stand and reach the rails, you’ll likely be more concerned about teething troubles and escape attempts then SIDS—the risk of which diminishes dramatically after your baby reaches six months. That said, you’ll want to ensure that all snaps and straps are well secured and do not pose a choking hazard. Avoid covers with buttons, as these may come loose and find their way into baby’s mouth. If your rail guard has ties, be sure that those ties remain fixed and do not exceed nine inches in length. A beautiful rail cover can really boost your nursery’s crib appeal, but when making your selection, be careful not to sacrifice function for fashion. Opt for a durable cover with at least a quarter-inch of padding, and make sure the material is stain-resistant and machine-washable. (There will be drool. So. Much. Drool.) A waterproof backing can also be helpful, protecting crib rails from moisture and preventing the build-up of germs and bacteria. Some covers even feature convenient toy latches, giving your baby additional, easy-to-clean options for their chewing pleasure. While many covers will fit most cribs, there’s no “one-size-fits-all” guarantee, so be sure to check your rails measurements before making your purchase. If you have curved or extra-thick crib rails, look for a rail cover with adjustable straps or ties. These will provide more flexibility than those that snap into place. While crib rails covers are becoming more and more popular, you won’t find much of a selection at your local baby-mart. Despite the dangers associated with bumper use, many crib bedding manufacturers continue to include bumpers in their bedding sets, making attractive alternatives difficult to find. You’ll have much better luck shopping online where vendors are more likely to be ahead of the curve. Popular designers like Caden Lane and Carousel Designs now carry a wide assortment of beautiful rail covers online, and Etsy’s talented merchants offer a bevy of bumperless bedding sets in dozens of customizable fabrics and colors. Love a good DIY? Try making your own rail cover with one of these brilliant and budget-friendly DIY ideas! Easy, no-sew crib rail cover: Create your own beautiful crib rail cover with this clever DIY project from Jane Marie Blog using soft, fleece material. Simply cut tabs into the material, thread the tabs through the crib bars, and tie to secure the fabric. No sewing required! Pool noodle rail cover: This clever DIY solution from Gumtreatment uses a similar no-sew technique as the previous project but adds a pool noodle for extra padding and drool-proof protection. Cut the pool noodle to fit the length of your rail, then cut a deep slit from one end to the other. Slide the slit over the rail, and let the noodle rest on top. Cover and secure as instructed above, allowing extra fabric for the noodle. Snap-on rail cover: Don't mind a little sewing? 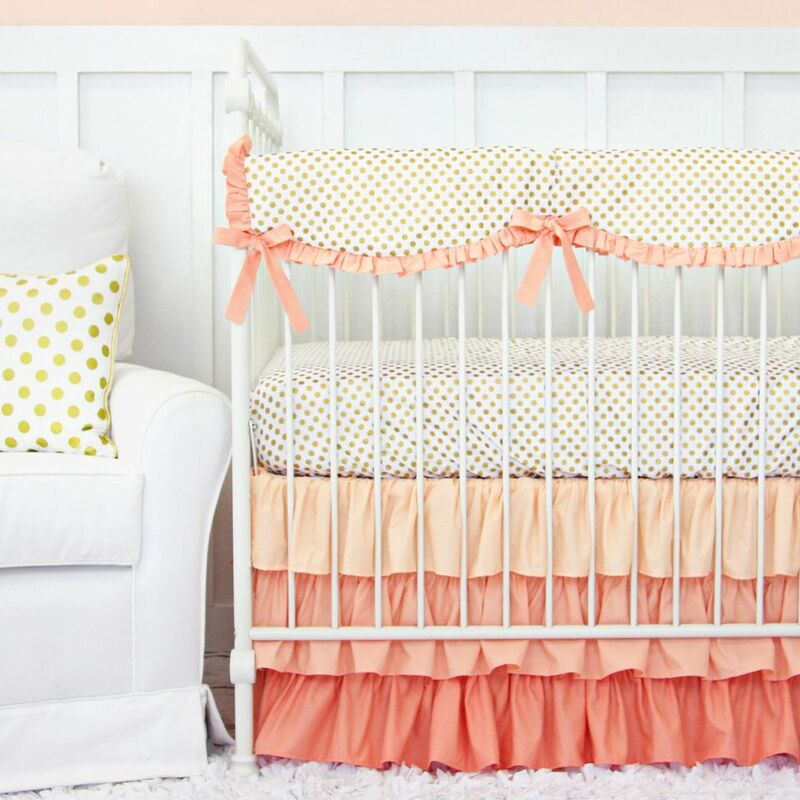 This beautiful and easy-to-recreate crib rail cover from Lit Centric will put an end to baby's crib-chewing habit in a snap!